I take photos of food... so much so its become a thing of legend for my friends and colleagues alike. I remember getting a whole heap of stick out on my third trip to Philly... but I didn't care... because its something I do. Its my way of being grateful. Anyway... my food photographing antics have reached a new level with my discovery (thanks to psfk.com) of the fab site eat.ly. The purpose of the site is to provide a visual reminder to folks of what they have eaten... and seek to encourage participants to think about what they eat. but also salads and veg. This Scotsman's diet isn't all fried. We eat regularly as a family... I know this because said family make fun of me taking yet more pics of food. I don't record everything I eat... only major meals. I do consider coffee to be a major food group but not necessarily worth recording every time. 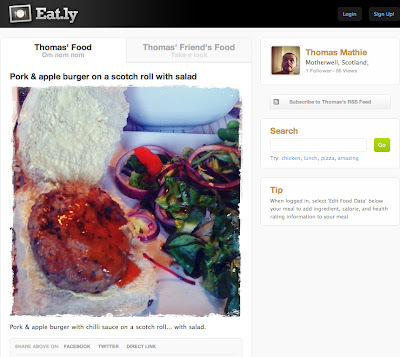 Please check out my eat.ly diary and consider whether the discipline would help you to be more mindful of what you eat. This is a really neat idea. I really enjoy cooking and trying out new recipes. I always have since my teenage years. I enjoy cooking for one or for a crowd. Since I became a vegetarian I've been trying out lots of new stuff and discovering unknown pleasures where I never knew they existed before. Thanks for sharing eat.ly on your site. I think I may sign up and post pics of any new veggie delights I discover or new recipes I attempt.